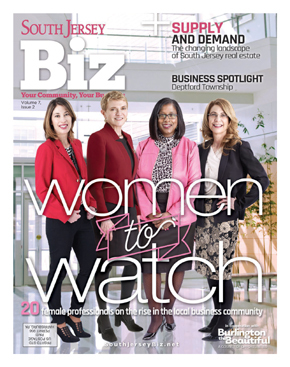 Whitesell is proud to announce Peggy Ireland’s inclusion in the recently featured article, “Women to Watch” appearing in the February 2017 issue of South Jersey Biz. Ms. Ireland is featured amongst twenty female professionals as a top dealmaker on the rise in the local business community. Ireland (Vice President, Leasing) has provided in-house representation of Whitesell’s office and industrial property portfolio for the past sixteen years, and has been a solid performer in the southern NJ commercial real estate marketplace for over two decades. 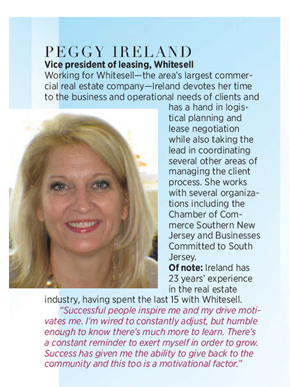 To view Peggy Ireland’s spotlight feature, click link below.